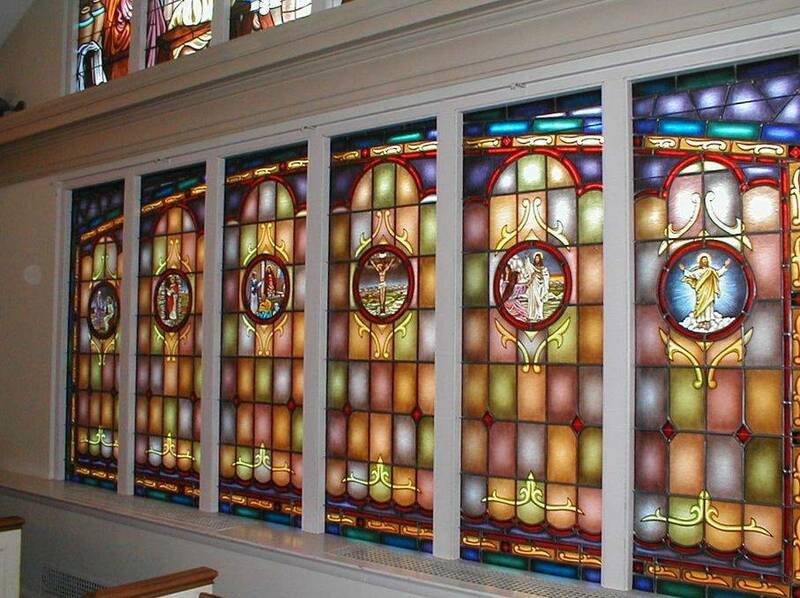 In 2002, Laws Stained Glass Studios installed (12) windows in the chapel at Christ United Methodist Church in Wheeling, WV. Four of the windows (size 37" wide x 63" high) were hand-stained glass windows with a 12" round Biblical scene from the life of Christ. Six more hand-stained glass windows (size 27" wide x 74" high) were designed together and each window had a 12" round Biblical scene. Above these six windows, a large hand-stained, pictorial glass window (size 180" wide x 83" high with a pointed top) that depicted the "Last Supper" was installed. Behind the pulpit, a light box window (size 72" wide x 52" high) was installed, and it has a full pictorial scene of "The Garden of Gethsemane." Laws began the installation by removing the existing wood sashes. The windows were installed into the existing wood frames. On the exterior, 1/4" Lucite acrylic was placed as the protective covering. The light box was mounted on the back wall, and it has an operable aluminum frame to access the light bulbs. Full pictorial hand-stained glass window depicting "The Last Supper"
This is a full pictorial hand-stained glass window depicting Christ in "The Garden of Gethsemane". This window is in a wooden light box behind the pulpit area.